Owning your own home has always been a big part of the American Dream, just as conventional home loans/mortgages have always been a big part of traditional lending institutions. Construction loans are a bit more complicated than conventional mortgage loans because you are borrowing money for a short term for a building that doesn’t yet exist. In addition, construction loans make up a very small percentage of a lenders portfolio and they are much harder to find than conventional mortgages. Building a custom “Dream Home” is a once in a lifetime experience. An emotional and financial investment of this magnitude should be carefully weighed and treated with the respect that it rightly deserves. You have specific needs, requirements and expectations and your construction financing should be tailored to meet your specific needs is extremely important if you want your home completed on time and on budget. Construction loans come in all shapes and sizes and settling for a generic “One-Size-Fits-All” construction loan can lead to a plethora of issues ranging from a larger than expected down payment and higher interest rates to misunderstood contractual obligations and unforeseen cost overruns. If that wasn’t enough, you’ll also get a reminder of just how stressful and unsatisfying your “dream home” building experience was when you pay your mortgage payment each month. Don’t settle for anything less than a construction loan that meets your specific needs from a construction financing professional that understand your needs and stands by your side every step of the way. 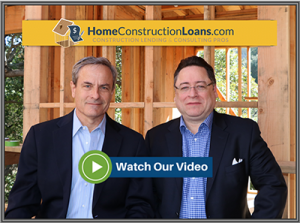 Don’t Settle for Anything Less Than Home Construction Loans!